As someone who is in marketing, it is quite entertaining to watch various candidates enter in to the hotly contested race for the president in 2016. As a result, I want to throw my hat into the ring because I understand the secret sauce related to becoming a presidential candidate. That secret sauce is both offline and online marketing (including social media). I am not a rich like Donald Trump, so I will delay my candidacy for president and instead blog about others marketing efforts. Sorry voters. Giggle. 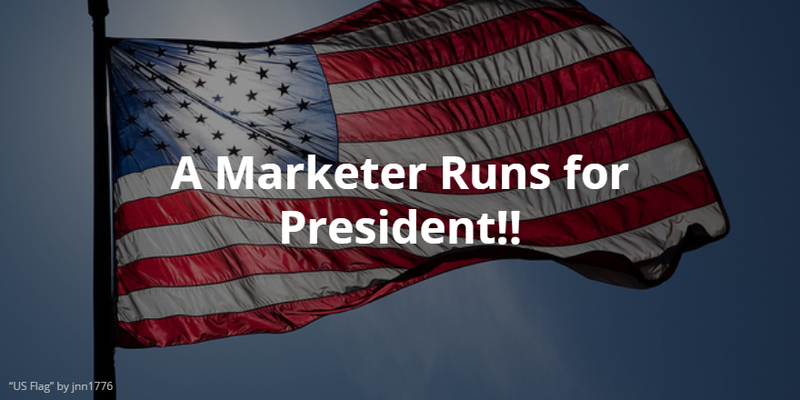 In this blog post, I am going to outline marketing in politics, so you can run for president if you chose to do so. There are about 5 key aspects to being successful, which are the following: communication/PR= social media, data=marketing analytics, marketing=messaging, engaging your base=customer engagement, and social media marketing=24/7 news cycle. If you notice, I describe things in terms of old and new media. Social Media has gained a place in politics per recent studies. Previously, candidates would have utilized expensive hard to get third party channels to communicate with the voting public. They had to hope that citizens saw or heard their message when it was sent out during a very small window of time. The campaign of President Barack Obama taught us that you can break that paradigm. His team at the time leveraged social media and digital technology to communicate their message directly to consumers. Social media allowed him to control the look, feel, and flow of that message to his potential voters. It created an easy way for it be shared, spread, and for voter participation. Additionally, mobile messaging technology allowed him to geo-locate and communicate with potential voters in a new real-time. This assisted him in being able to communicate a personalized message to voters gaining their attention outside of the normal news cycle. As it stands now at the time of writing this, Donald Trump is leading the way with engaging his base. There are a couple of metrics and reasons supporting his success. One key reason is that he is a polarizing and provocative personality that has tapped into some social & psycho-graphic issues of the Republican voting bloc. Many Americans are very frustrated about the economy, immigration, and the societal social change, which he hits upon in stump speeches thereby connecting with them. Currently, he has a tremendous lead on the other republican leaders vying for the Republican nomination for president. Additionally, voters are turning out to see Donald Trump make speeches and connect with him. Potential voters are connecting online, offline, and reflecting that in their tentative polling supporting him. He is a great marketer really tapping in the emotional and intellectual motivations of his voting bloc. Online as well as social media has become such an integral part of political campaigns. President Barack Obama’s success was partially do his integrated grassroot efforts both offline and online marketing circumventing the 24/7 media outlets. The republicans really ignored that aspect of marketing, which may have assisted in contributing to their lack of success in the last president election. This time around both parties seem to understand the importance of leveraging social media. One candidate in particular seems to be winning the social media vote via many experts and that is Senator Bernie Sanders. He proves that President Obama success can be replicated on social media. Honorable digital mention goes to Senator Lindsey Graham who made a phone upgrade and got a iPhone, sadly because of Donald Trump. Senator Lindsay Graham don’t be afraid to use your phone for email. J Senator Bernie Sanders is definitely successfully leveraging social tools to be connected 24/7 with those social savvy voters, while controlling his message. Well, I think I have identified the top marketing tends in politics. Are you ready to announce your candidacy for presidency? I will vote for you and handle your marketing.